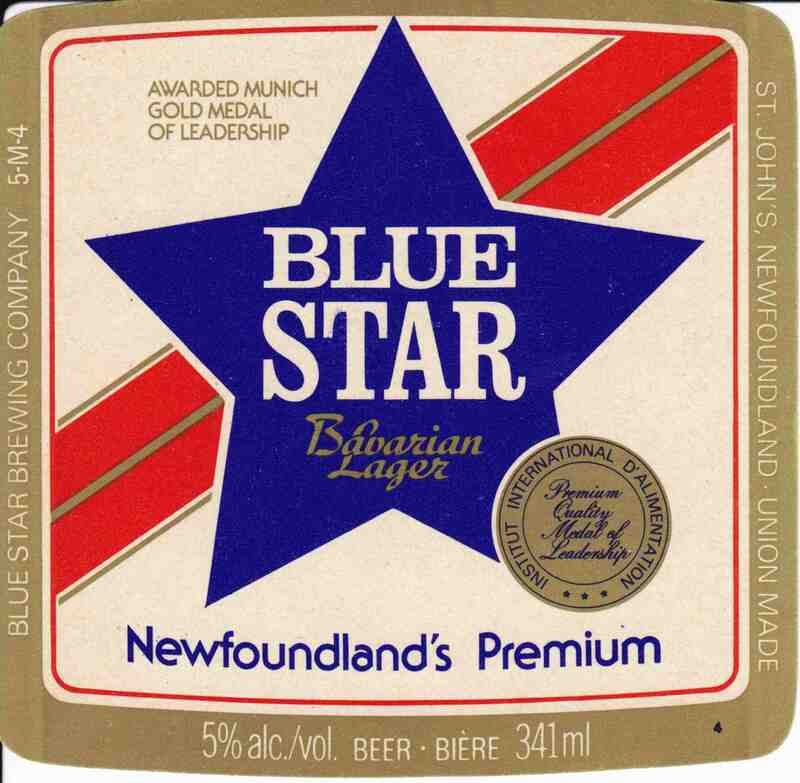 Blue Star is perhaps the most iconic of all Newfoundland beers. 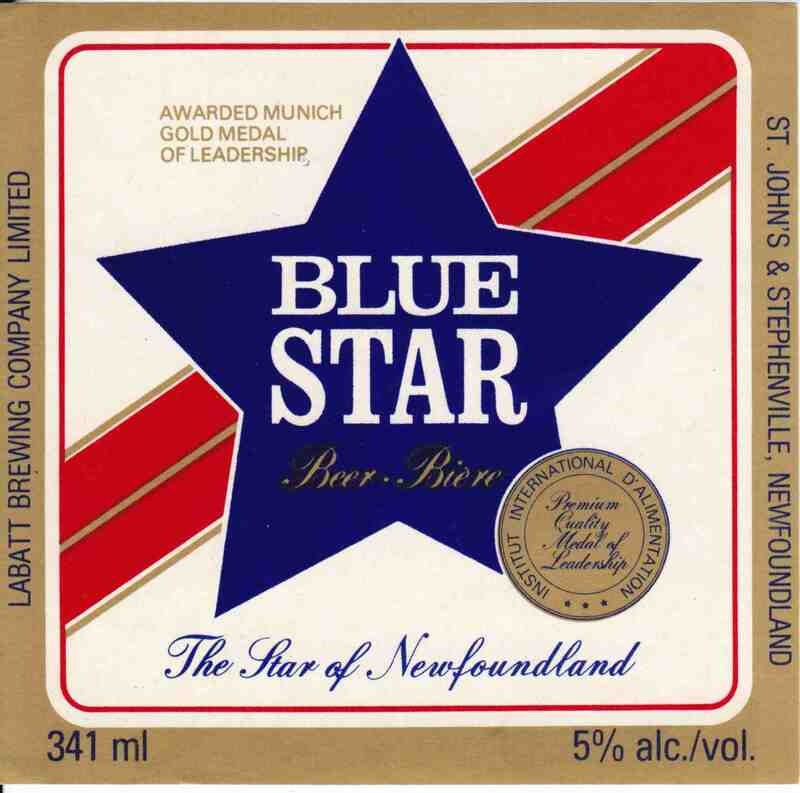 Still atop the top selling beer list at the Newfoundland Liquor Corporation (at least as of this writing), Blue Star is rivalled only by Black Horse as the nostalgia macro most recognized by Newfoundlanders as their very own. Blue Star has had not shortage of coverage on this blog either. 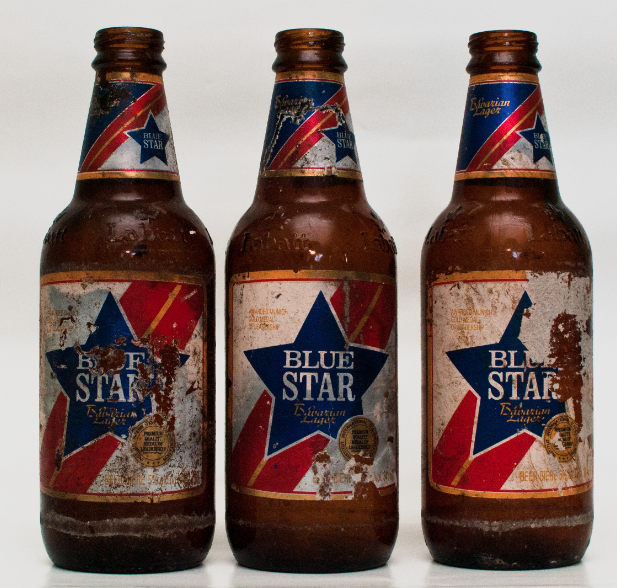 My evolution of Blue Star is one of the most popular posts and brings us through its many changes since the 1960s. Writing a blog about history is a tricky thing because you are really tied to your sources. Sometimes you find a bunch, sometimes months go by without anything coming up. 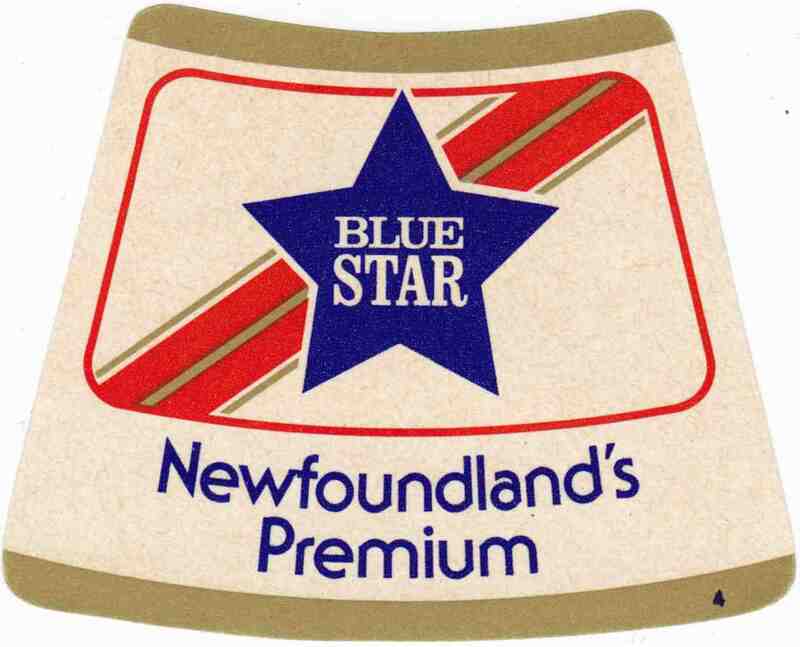 Well, recently I repatriated, to Canada at least, a bunch of Blue Star labels from a collection over in Hull, England. So, in this post: six more Blue Star labels and my best attempts at putting them in correct order. I’ll start with the label I think is the oldest. It has to be newer than 1974, when Labatt took over the Bison Brewery in Stephenville, and older than 1981. If you have a Blue Star label which lists both locations it’s likely from somewhere inside that window of time. I think this might be the oldest because it lists “Over 4% alcohol by volume,” which was the norm until the 1970s. I would estimate this one is from around 1975. The only differences between this one and the last is the text color and, as noted above, the change in how the alc/vol is listed. Spot the differences! 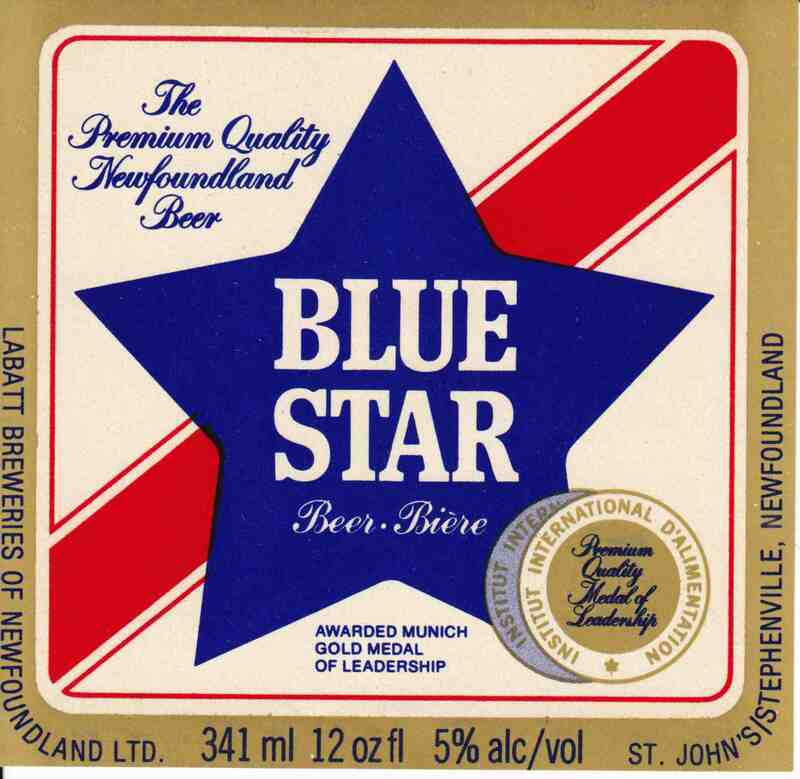 In the 1970s the slogan “The Star of Newfoundland” replaced “The Premium Quality Newfoundland Beer” line. The only difference I can spot between these to examples is the reverse of the text on the sides. I’m going to go out on a limb and argue that the slogan “The Sportsman’s Friend” came after “The Star of Newfoundland.” Why? Well, in the above label Stephenville has been dropped from the brewery’s locations. Everything else though, seems to remain the same. Both of these have the slogan “Newfoundland’s Premium” which I think was used in the 1980s. Stephenville is not listed, so it’s outside of the 1974-1981 window. Since it’s listed as 5%, it’s likely past 1981. In order to have a tie around its neck, it needed to have a neck, so this was also post-stubbie. Here’s the odd thing. It lists “Blue Star Brewing Company” as the brewery. 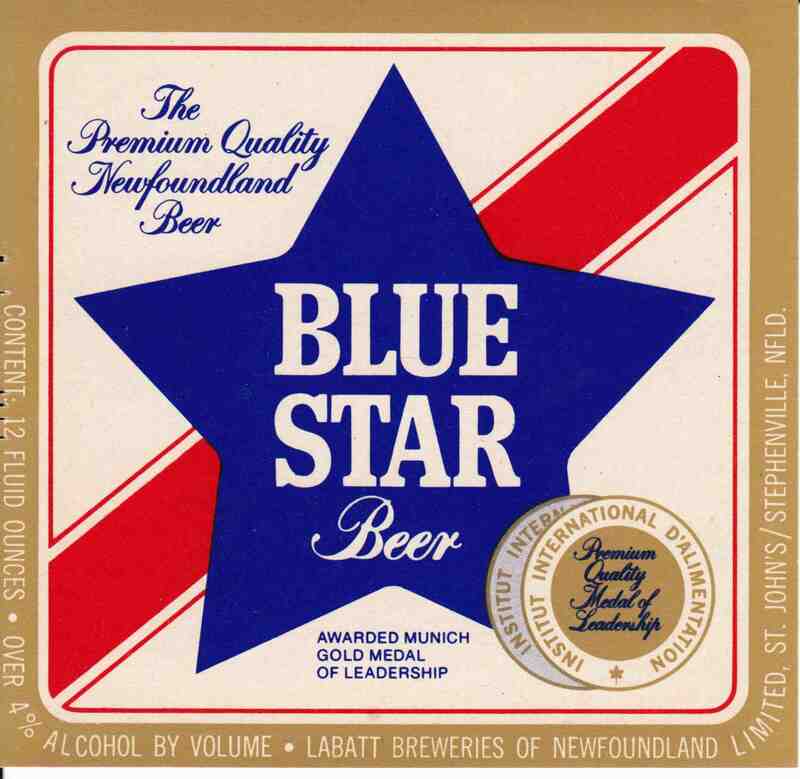 Now, checking the trademark database shows that Labatt has owned the trademark “Blue Star” since 1967, so this company was clearly Labatt trying to distance its name from the brand (see the trademark database here). Why they might do this, I don’t know. It might be a move predating Rickards, Shocktop, Blue Moon, Alexander Keiths, and other “crafty” beers brewed by big brewers without much reference to their main brand. Why they’d do it in 1980s Newfoundland is unknown. It’s my guess that this was the label used until the label change to the very-1980s labels I have in scruffy condition below. Note that it’s listed as a “Bavarian Lager” again on these labels. So, a few more steps along the way of Blue Star evolution have been found and documented! Photo by Curtis Wiest, 2013. 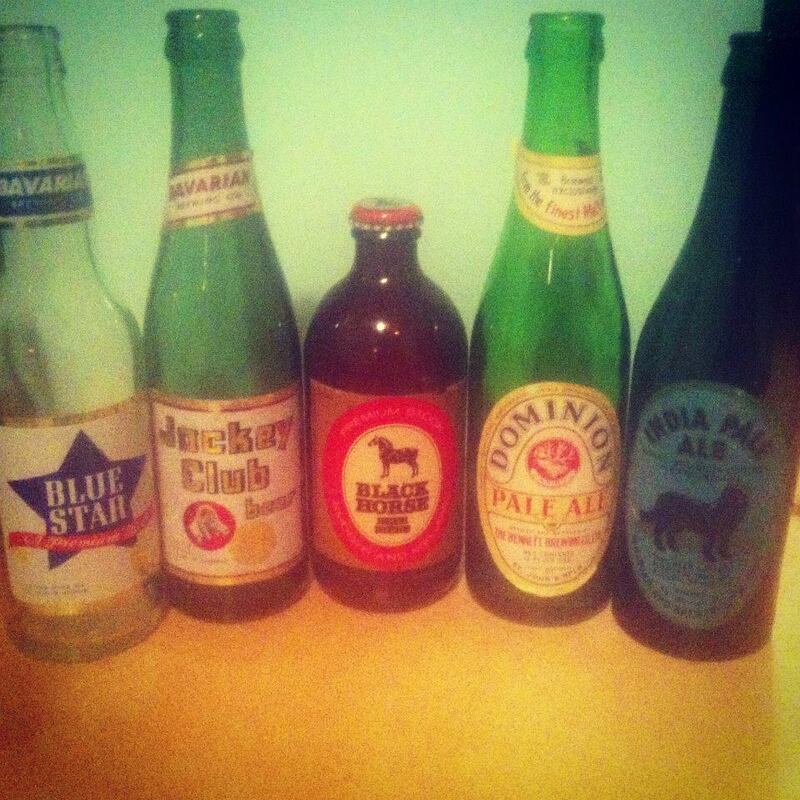 On another note, reader Curtis Wiest recently send me in this picture of a few stubbies he has tracked down. He’s trying to put together enough to recreate Sean Hammond’s famous “Newfoundland Stubbies” painting (see the painting here) and he’s a few short. He contacted me to let me know he found an O’Keefes Extra Old Stock one already, but he’s still short a Jockey and a India Beer. Can anyone help him out? Come to think of it, since I’ve never seen an India or a Jockey stubby, if you have one could you send along a picture? 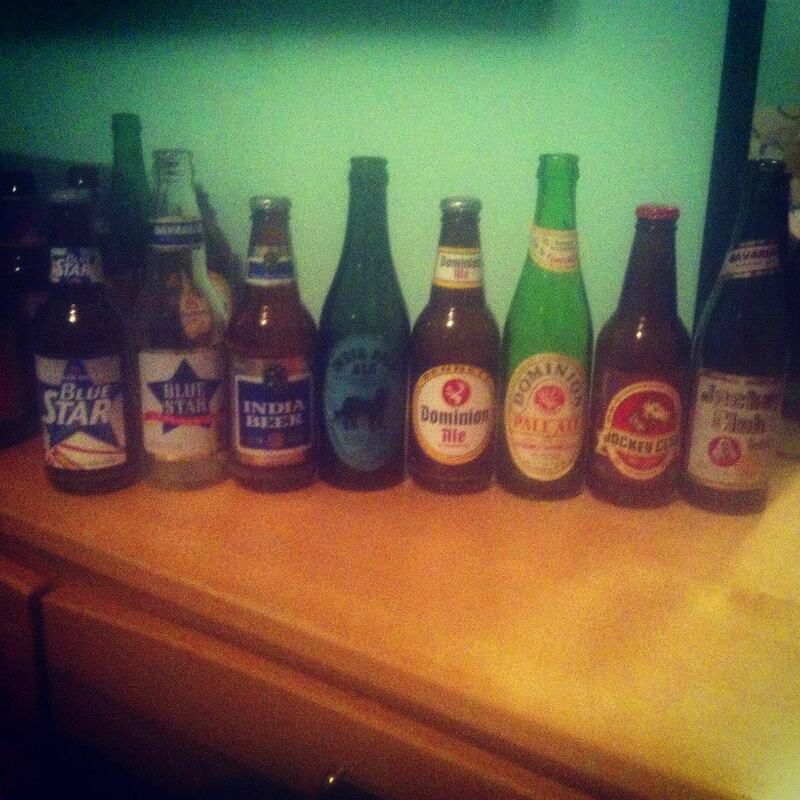 Just a little update post to let you folks know that I’ve post a set of Classic Newfoundland Beer Bottle pictures over on the Newfoundland Beer History facebook page. They’re pretty grainy in quality, so I’m not intending to host all of them here. Most of the bottles are ones that I have posted elsewhere on this blog, but there are a few new ones which will be featured in upcoming posts. Can you honestly say that if you had 1960-80s bottles and contemporary ones you wouldn’t snap a quick pic with your phone camera? It’s Christmas time in Newfoundland and I’m home for the holidays, which means drinking lots of Newfoundland Christmas beer. Fortunately for craft beer drinkers, two of Newfoundland’s craft breweries have recently started producing seasonal ales for the holidays. Quidi Vidi began producing their Mummer’s Brew (an rich Amber Ale) several years ago. Originally featuring a Newfoundland Mummer’s party – a night of dressing up and touring around the community dancing, drinking, and playing music – the label has now been modernized to fit in with their new streamlined packing design. Its available on tap at a few places in the city (I’ve had it at Christian’s on George and the Duke of Duckworth so far) and it’s also in 6-packs at NLC locations and at the brewery (which is also beautifully decorated for Christmas)! The other seasonal beer brewed up for Christmas is Yellowbelly’s Mummer’s Brew. I know – I know – there are only three craft breweries in Newfoundland and two of those three have made a Christmas seasonal with the same name… Go figure! Yellowbelly’s Mummer’s Brew first appeared in 2011 when it was a quite tasty spiced Winter Ale. This year (2012) it has changed to a 7% Chocolate Porter. Its available down at the brewery on tap and in bottles, which you can also find at NLC locations. The Washington Post; Dec 10, 1947. Of homebrew or alky, whatever you got. As the first year comes to a close for the Newfoundland Beer History Project, I’d like to say thank you for everyone that’s shown encouragement for this project and who has shared in my interest in learning about Newfoundland’s beer history! Over 10,000 people have checked out this blog in this first year and I’ve got a lot more planned for the future. I hope the holidays treat everyone well and that good beer can find you where ever you are! The Atlantic Canada Beer Blog is a great resource for keeping up with brewery news, beer releases, and other important information about the brewing scene throughout Atlantic Canada. They recently contacted me to do an interview on both this project and to talk about the current brewing scene in Newfoundland. If you’re interested you should check it out here. You should be reading the Atlantic Canada Beer Blog anyway! Over the last few weeks I have been doing lots of little pieces of research that I’m working on putting together into posts. Some of the topics I’ve noticed people looking for on the blog, while other’s I just cannot find anywhere else on the Internet. Here are a few of the things that I have in progress right now. New Labels! 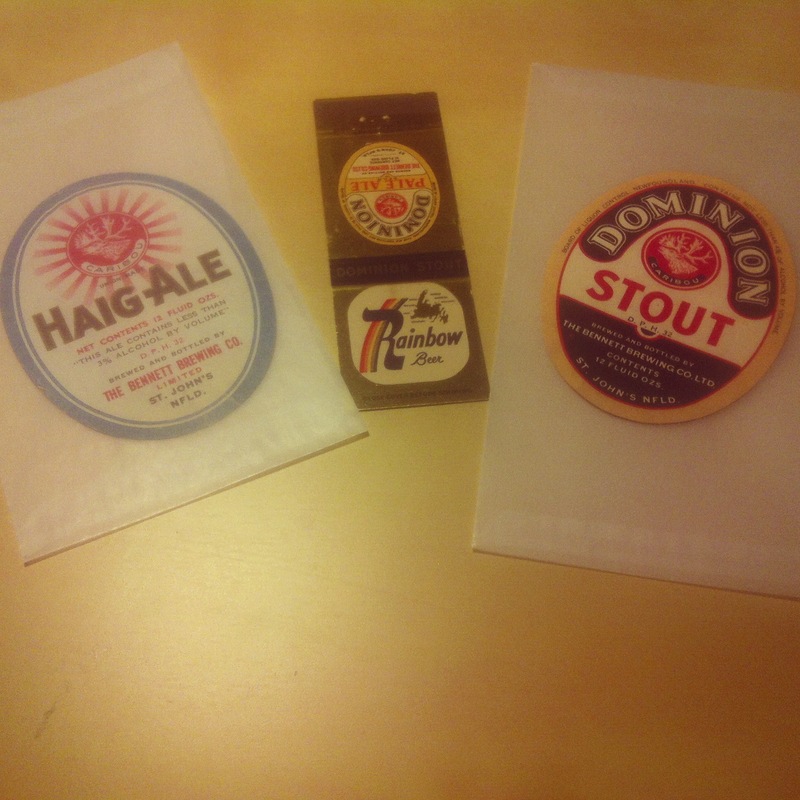 I recently tracked down a Bennett’s Haig Ale label along with others including a Dominion Stout label and a Bennett Brewing matchbook from the 1960s. Expect some high resolution scans. The Haig Ale label is really great. There are legal implications around beer brands and branding. They are something breweries own. But when did this ownership transfer to the macros and what brands were important enough to have Canadian copyrights? I’ve got the answer… I just need to write it up! Black Horse Ale advertisement in the New York Times. June 7, 1948. A scotty and a smoke. Black Horse was brewed in the United States for a long time, for a while under contact from Dawes (see the Dawes brand on the above label?) and later, after a court case, an independent American brand, so there are some Black Horse advertisement from the New York Times and the Washington Post that I’ve got my hands on that I want to post. I have six Dominion Ale coasters from the 1970s that I’ve been meeting to digitize. The problem is that they are still in their original cellophane package, so I’ve been having trouble committing to opening it! From the Acts of the Privy Council (Colonial) 1702. 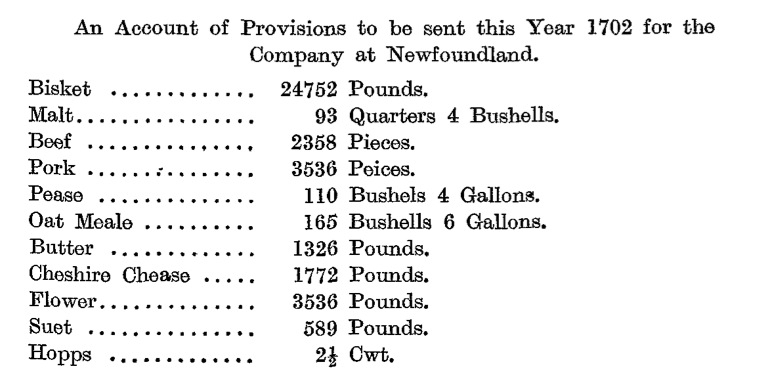 I posted this on the NL Beer History Facebook a while back showing some provisions sent to Newfoundland back in 1702 from the American colonies. It included included around 250 pounds of Hops, likely meaning that beer was being brewed in, rather than imported to, the colony at that time! I have some other academic articles (mostly from people like Peter Pope and John Wicks who have done some historical and archeological work at Ferryland) which discuss early, pre-20th century, brewing in Newfoundland which I am working on putting together into an post. I’m working on a very detailed post about the Bennett Brewing Newfoundland Song book collection. This has actually attracted some folklorists from Memorial Newfoundland in the past (though I’m not a big fan of how they’ve approached the subject), so I’m hoping to include some more academic work into the article. I’ve also got some great pictures from the two editions that I’ve got. 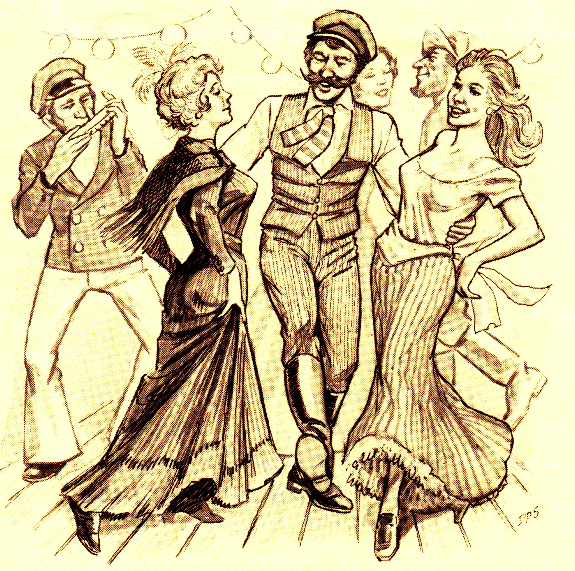 The original most interesting man in the world, from the Bennett Brewing Songbook, won Movember before it existed. So, I have no shortage of work to do! In the next month or so I’m hoping to get posts written up on these topics, so keep checking in with the Newfoundland Beer History project! 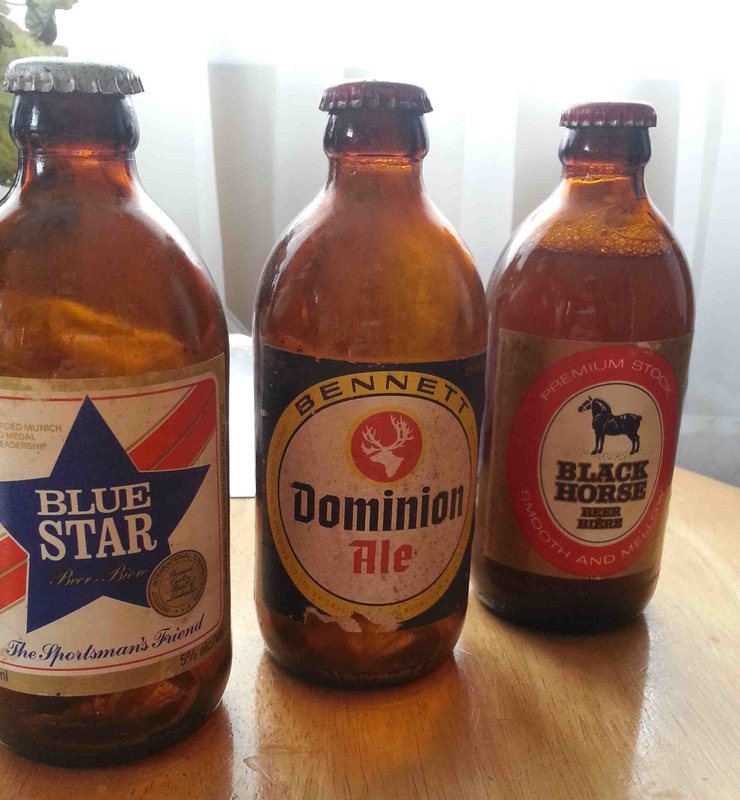 A lot of the traffic I get on this blog comes from people looking for an answer to some variety of the question “why does Newfoundland have short neck beer bottles?” It’s a good question, but one for which the internet is not rife with answers. One of the first things that most people notice when they first come to Newfoundland (or when they first go away) is that Newfoundland beer bottles are a little shorter, just about an inch off the neck, than most beer bottles you’ll find almost anywhere else in North America. Even for big breweries like Labatt and Molson, though the beer inside and the labels are identical, the bottles are different. 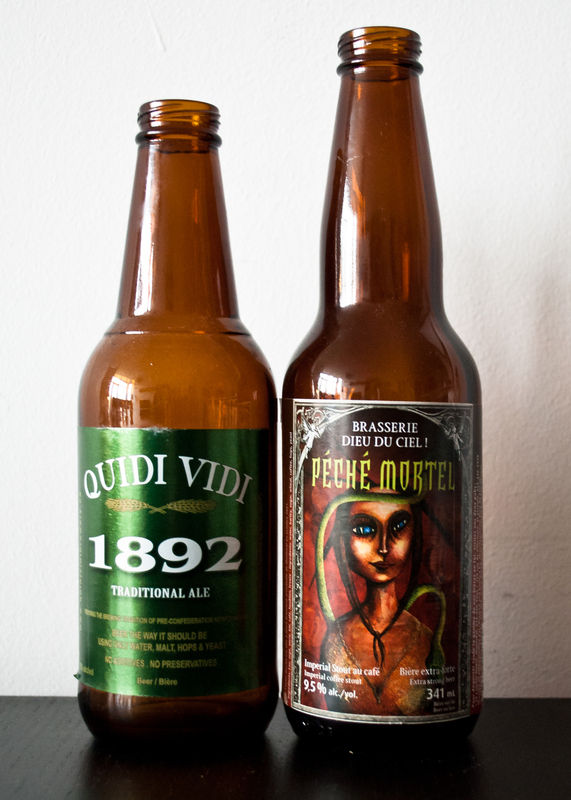 Bob-21 (Quidi Vidi Brewing 1892) vs. Long Neck (Dieu du Ciel Péché Mortel). The best answer I’ve found to this historical question was published in The Telegram (St. John’s biggest local newspaper) by Russell Wangersky in November of 1999. Wangersky, reporting on a bottle shortage of the bottles in the provence, provides a good bit of insight into why the little bottle, known in the industry as Bob-21, has stuck around in the provence. Wangersky is a better source if you can access newspaper archives, but as googling does not yield his article and most people don’t have easy access to newspaper archives, I’m going to go over the story here. The short history goes like this. When the industry moved away from stubby bottles in the mid-1980s (due to pressure from more attractive looking long necks from the import and American markets) each brewery was left to its own devices to figure out what kind of bottle they should use. (The rise of the stubby as an industry standard is, in itself, an interesting historical development which is covered well in both Brew North by Ian Coutts and Cheers! A History of Beer in Canada by Nick Pashley.) On the mainland the big three breweries (Carling-O’Keefe, Molson, and Labatt), likely due to the proximity of the more aesthetically pleasing taller bottles coming from American imports like Miller, settled on the long neck (see page 120 of Coutts for more on the American influence). The story differs on the island in part due to Carling-O’Keefe’s dominance in the market. Having control of the old Bennett brands and the popular Black Horse beer, the interim bottle used by Carling-O’Keefe became standard in Newfoundland. Why? Well, there were simply too many Bob-21 bottles kicking around the provence to warrant the economic cost, which Wangersky quotes to be around $10 million, of switching. That’s largely what keeps the bottle around too, as switching would require the whole old stock of bottles to be trashed rather than be reused some 15 to 20 times as they normally are. The bottle might not have a great backstory, but the cultural value of the little guy stands for more than the odd economic lock-in that keeps it in circulation. Everyone hears the stories of a Newfoundlander hitting the clubs in Toronto for the first time, only to chip their front teeth on those longer-than-expected necks. There is something very tacit about the cute little bottles that makes them feel, well, homey somehow. Anyway, Internet, there is the answer to the question. I’d love to hear about what folks think about the Newfoundland Short Neck bottles, so do leave a comment or pop me an e-mail if you’ve got any strong feelings towards the little Bob-21 bottle. For more information see Russell Wangersky “Calling all empties: Breweries short on bottles asking beer drinkers to turn them in” The Telegram, November 12, 1999, p. 27. 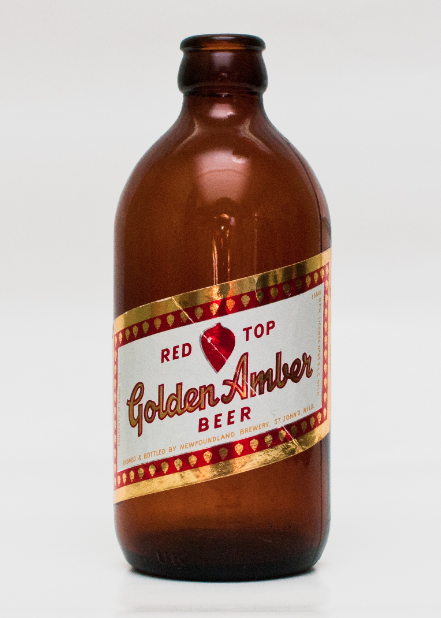 Newfoundland Brewery’s Red Top Golden Amber Beer, my collection. I found this bottle down at Livyers’ Antiques on Duckworth Street in St. John’s in June of 2012. All I really know about it is that it was brewed by Newfoundland Brewery, probably before 1962, though the stubby makes me question that. Stubbys were usually a little later into the 1960s, but it could be that the Newfoundland Brewery was ahead of the curve. It’s a very heavy stubby and the corners feel more well rounded than many more modern examples. It feels very solid even compared to the 1970s bottles from the Atlantic Brewery. So that’s it. A bottle that I know very little about other than from inference. Well, at least it’s a looker!